Is the cure for that next cold. . . your love handles? If your pants are too tight, perhaps there’s a silver lining. Consider a new study by researchers at the National Institutes of Health. They discovered that fat may play an important role in fighting infections. How, you ask? Our immune system is like a disease-fighting army. Before bringing out the big guns, it deploys a strike force of rapidly responding immune cells. The research team looked at the response of these special cells in mice and monkeys. They found that the cells were activated by fat tissue that lives under the skin. 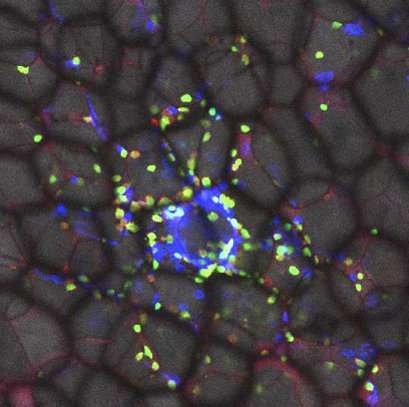 When exposed to pathogens, these fat-activated immune cells learned how to fight back! Each time they were under attack, they developed a shield. The next time they were exposed to the infection, they were more resistant. Does this mean you can have your cake and eat it too? Well, too much fat is still bad for your health. But armies march on their stomachs, so be kind to yours?